Since the beginning of the XIX century Triumph Square has become a significant public space in Moscow. Just then the space formed in stable square (quadratic) shape. The type and scale of development which surrounded it have changed over time, but the outline of the quadrangular square remained unchanged for almost 2 centuries. "Quadratic" history of the site ended with the demolition of the theater "Sovremennik". Dimensions of the area expanded to the hotel "Beijing". Since then it has lost its former scale in favor of the now outdated urban planning principles that give more importance to the majesty than convenience. Today Triumph Square (in 2014) did not become a complete architectural ensemble. Now it is a kind of urban space with broken pedestrian flows and multiscale buildings. The area did not become an attractive place for residents and guests. Return the historic, human-friendly scale to the square in order to assemble fragmented environment in a single ensemble. Generate an attractive urban space for Moscow citizens. 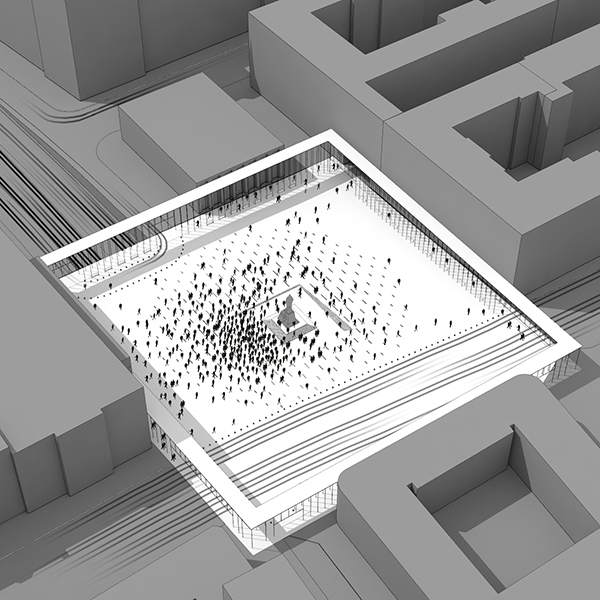 In the project we are restoring historical justice, returning the to square former outlines of a quadratic shape. All the space is paved with light gray granite. The surface of the square is monotonous, laconic and does not have any gaudy design refinements. This solution does not dictate behavioral patterns to visitors. Square space as a blank sheet of paper, emphasizing universality for any kind of urban activities. Just around the monument Mayakovsky amphitheater organized a small playground for literary readings. 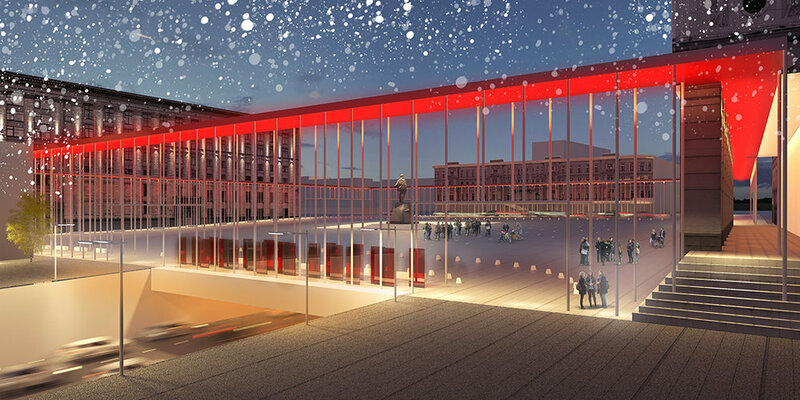 The architectural proposal is suitable to organize town festivals, fairs, concerts, meetings, evening screenings in the open air. The square is surrounded by permeable colonnade. Its main purpose - to gather the space around and give it a human scale. Colonnade embodies a system of arches extending on the perimeter, which also refers to the first triumphal arch, once installed on the square. The square becomes a parade and truly triumphant mood. In addition, the colonnade serves purely utilitarian features as protection from the rain near the building and over the pedestrian crossing the streets.